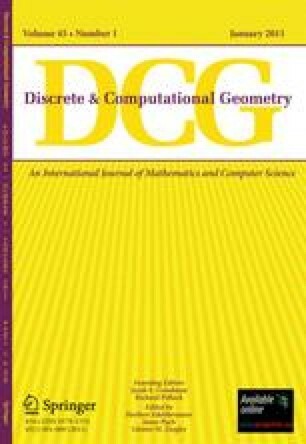 This paper gives several new demonstrations of the usefulness of random sampling techniques in computational geometry. One new algorithm creates a search structure for arrangements of hyperplanes by sampling the hyperplanes and using information from the resulting arrangement to divide and conquer. This algorithm requiresO(s d+ε ) expected preprocessing time to build a search structure for an arrangement ofs hyperplanes ind dimensions. The expectation, as with all expected times reported here, is with respect to the random behavior of the algorithm, and holds for any input. Given the data structure, and a query pointp, the cell of the arrangement containingp can be found inO(logs) worst-case time. (The bound holds for any fixed ε>0, with the constant factors dependent ond and ε.) Using point-plane duality, the algorithm may be used for answering halfspace range queries. Another algorithm finds random samples of simplices to determine the separation distance of two polytopes. The algorithm uses expectedO(n[d/2]) time, wheren is the total number of vertices of the two polytopes. This matches previous results  for the cased = 3 and extends them. Another algorithm samples points in the plane to determine their orderk Voronoi diagram, and requires expectedO(s 1+ε k) time fors points. (It is assumed that no four of the points are cocircular.) This sharpens the boundO(sk2 logs) for Lee's algorithm , andO(s2 logs+k(s−k) log2s) for Chazelle and Edelsbrunner's algorithm . Finally, random sampling is used to show that any set ofs points inE3 hasO(sk2 log8s/(log logs)6) distinctj-sets withj≤k. (ForS ⊂E d , a setS′ ⊂S with |S′| =j is aj-set ofS if there is a half-spaceh+ withS′ =S ∩h+.) This sharpens with respect tok the previous boundO(sk5) . The proof of the bound given here is an instance of a “probabilistic method” . A preliminary version of this paper appeared in theProceedings of the 18th Annual ACM Symposium on Theory of Computing, Berkeley, CA, 1986.